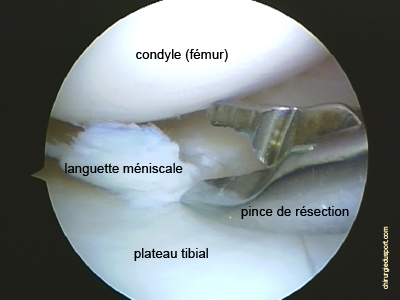 The regularization of the tongue of the meniscus is performed arthroscopically. This adjustment is done using small instruments (scissors, pliers ..). Resection with forceps arthroscopic meniscal of the tongue. 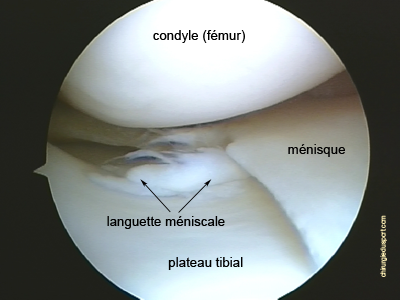 Appearance of the meniscus after meniscal regularization at least: partial meniscectomy. Doctor Nicolas LEFEVRE, Doctor Serge HERMAN, Doctor Yoann BOHU. 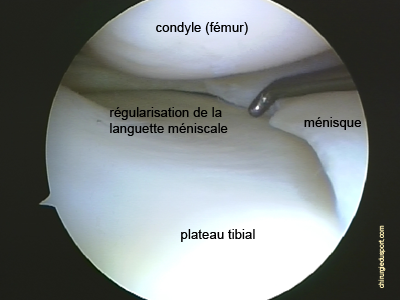 - 22 mars 2011.
bucket handle meniscal dislocated in the notch. Doctor Nicolas LEFEVRE, Doctor Yoann BOHU. Lesion of the posterior segment of the medial meniscus, dislocated unstable tab in the notch. MR appearance and image arthroscopy. MRI image of a meniscal tab. The diagnosis of a torn anterior cruciate ligament is clinical. (Fig 1) . The normal ACL appears on MRI as a band of hypointense signal, stretched between the femur and the tibia. Its limits are clear.